Located in the heart of downtown Albuquerque, Maisel’s Indian Trading Post has been selling Southwestern and Mexican curios for over 65 years. Completed in 1939, the building was celebrated for what Albuquerque Progress, the local business magazine, described as its Indian Pueblo architecture. The distinctive façade clearly signaled the building’s function to tourists, making it a popular stopping place for souvenirs of the Southwest, a role it continues to fulfill today. Maurice Maisel built the trading post in the late-1930s after the rerouting of Route 66 through Albuquerque. Mr. Maisel selected architect John Gaw Meem, the leading proponent of the Pueblo Revival style, to design the building. Mr. Maisel advised Mr. Meem that he was “not content with the usual Indian thing.” The flat-roofed, one-story building is located in the middle of a commercial block. The front features large display windows set on a base of carrara glass (a trade name for pigmented structural glass) topped by a continuous panel of murals of Southwestern Indians in ceremonial clothing. 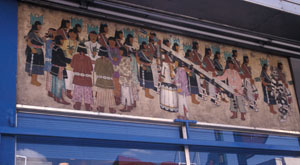 Mr. Meem hired Olive Rush, a prominent artist of the period, to design the murals depicting various aspects of American Indian ceremonial life. The young artists, including Pablita Velarde, Ben Quintana, Harrison Begay, and Pop Chalee, later became highly regarded for their careers. The Maisel Trading Post was unique in that it was the only Pueblo Deco building in Albuquerque that employed work by Pueblo and Navajo artists. The building’s front windows recede at the entry, forming a large protected space 20 feet deep with additional display windows. This protected space has a glazed terra cotta floor with American Indian designs and the name "Maisel’s" inlaid in front of the double wood-framed commercial doors. By the 1940s, the trading post had become the largest of its kind on Route 66 and at one time employed over 300 American Indian craftsmen onsite. The store closed after Mr. Maisel died in the 1960s. In the 1980s, Mr. Maisel’s grandson, Skip Maisel, reopened the shop. 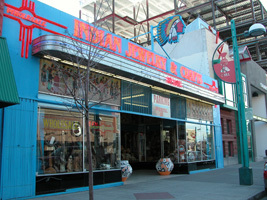 It was listed in the National Register of Historic Places in 1993. Maisel’s Indian Trading Post is located at 510 Central Ave. SW in Albuquerque, NM right near the intersection of Historic US 66 and 5th St. NW. It is open Monday-Friday 9:00am-5:00pm. For further information, call 505-242-6526.